Entries must be received through the contest registration process including social media and/ or online per the deadline listed on contest promotion or by mail using the information included below. One entry per person. One winner per household. Sweepstakes open only to legal residents of the United States and the District of Columbia, who are 18 years of age or older or who have written parental/ guardian consent with the name of the contest clearly indicated. Void wherever prohibited by law. Families and employees of Outdoor News, Inc. and participating sponsors are not eligible. No liability is assumed for lost, late, incomplete, inaccurate, non-delivered or misdirected mail, or misdirected e-mail, garbled, mis-transcribed, faulty or incomplete telephone transmissions, for technical hardware or software failures of any kind, lost or unavailable network connection, or failed, incomplete or delayed computer transmission or any human error which may occur in the receipt of processing of the entries in this Sweepstakes. By entering the sweepstakes, entrants agree that Outdoor News, Inc. reserves the right to contact entrants multiple times with special information and offers. Providing an email address automatically registers you for the Outdoor News. Outdoor News, Inc. reserves the right, at their sole discretion, to disqualify any individual who tampers with the entry process and to cancel, terminate, modify or suspend the Sweepstakes. Winners agree that Outdoor News, Inc. publications and participating sponsors, their subsidiaries, affiliates, agents and promotion agencies shall not be liable for injuries or losses of any kind resulting from acceptance of or use of prizes. No substitutions or redemption of cash, or transfer of prize permitted. Any taxes associated with winning any of the prizes detailed below will be paid by the winner. Winners agree to allow sponsors to use their name and pictures for purposes of promotion. Sponsors reserve the right to substitute a prize of equal or greater value. All Federal, State and local laws and regulations apply. Selection of winner will be chosen at random at the Minnesota Outdoor News, Inc. office on or before date specified in contest promotion. Winners will be contacted by the information they provided in the contest sign-up fields and have 7 days to claim their prize before another winner will be picked. Odds of winning will be determined by the total number of eligible entries received. Purchase is not necessary. Duplicate entries will disqualify entrant. Mailed entries must include contest name, entrant’s name, date of birth, complete mailing address, daytime contact phone number and complete email address. Information must be printed and legible. Mailed entries must be received on or before final contest date as stipulated on contest promotion. Late or illegible entries will not be considered. Mail to: CONTEST ENTRY, Outdoor News, Inc., 9850 51st Avenue N, Suite 130, Plymouth, MN 55442-3271. Address may also be used for list of contest winners. Requires listing of contest name and include a self addressed, stamped envelope. Request for contest winners must be received in writing within 30 days of published contest close date. Submitting an entry constitutes your full and unconditional agreement to and acceptance of these Official Rules and the decisions of the Sponsor and judges, which shall be final and binding on all matters relating to the Contest. Contest/ Sweepstakes Rules and Regulations: Contest will award a total of three $100.00 (One Hundred US DOLLAR) Visa™ gift cards. Visa™ is in no way a sponsor or provider of endorsement of this contest in any form. The contest prizes will be selected to be awarded one time within the period of January 15, 2018 to January 31, 2018 for qualified entries received between December 18, 2017 – January 4, 2018. Drawing will be random in nature and winners will be notified via email within one month of the two respective drawings. To qualify, entries must be received through the contest registration process (Outdoor News Survey Link). Completion of survey via this link is required to submit entry. A non-survey entry may be submitted by mail using a 3-by-5-inch card legibly written containing all of the following information: Daytime Telephone Number, First Name, Last Name, Complete Mailing Address, City, State, and Zip Code. Electronic, scanned, faxed, or photocopy non-survey mail entries will not be accepted. Entries must be received by dates listed. Mail to: MARKETING NON-SURVEY CONTEST ENTRY, Outdoor News, Inc., 9850 51st Avenue N, Suite 130, Plymouth, MN 55442-3271. One entry per person. One winner per household. Sweepstakes open only to legal residents of the United States and the District of Columbia, who are 18 years of age or older or who have written parental/ guardian consent with the name of the contest clearly indicated. Void wherever prohibited by law. Employees of Outdoor News, Inc. / ODN SHOWS LLC are not eligible. No liability is assumed for lost, late, incomplete, inaccurate, non-delivered or misdirected mail, or misdirected e-mail, garbled, mis-transcribed, faulty or incomplete telephone transmissions, for technical hardware or software failures of any kind, lost or unavailable network connection, or failed, incomplete or delayed computer transmission or any human error which may occur in the receipt of processing of the entries in this Sweepstakes. By entering the sweepstakes, entrants agree that Outdoor News, Inc. / ODN SHOWS LLC reserves the right to contact entrants multiple times with special information and offers. Outdoor News, Inc./ ODN SHOWS LLC reserves the right, at their sole discretion, to disqualify any individual who tampers with the entry process and to cancel, terminate, modify or suspend the Sweepstakes. Winners agree that Outdoor News, Inc. publications/ ODN SHOWS LLC and participating sponsors, their subsidiaries, affiliates, agents and promotion agencies shall not be liable for injuries or losses of any kind resulting from acceptance of or use of prizes. No substitutions or redemption of cash, or transfer of prize permitted. Any taxes associated with winning any of the prizes detailed below will be paid by the winner. Winners agree to allow sponsors to use their name and pictures for purposes of promotion. Sponsors reserve the right to substitute a prize of equal or greater value. All Federal, State and local laws and regulations apply. Selection of winner will be chosen at random at the Outdoor News, Inc. office on or before date specified in contest promotion by Outdoor News, Inc. staff/ representatives. Winners will be contacted by the information they provided in the contest sign-up fields. Odds of winning will be determined by the total number of eligible entries received. Purchase is not necessary. Duplicate entries will disqualify entrant. If the contest is not a designated digital response entry, mailed entries must include contest name, required contest material, entrant’s name, date of birth, complete mailing address, daytime contact phone number and complete email address. Information must be printed and legible. Applicable mailed entries must be received on or before final contest date as stipulated on contest promotion. Late or illegible entries will not be considered. Mail to: MARKETING DEPT NON-PURCHASE CONTEST ENTRY, Outdoor News, Inc., 9850 51st Avenue N, Suite 130, Plymouth, MN 55442-3271. Address may also be used for list of contest winners. Requires listing of contest name and include a self-addressed, stamped envelope. Request for contest winners must be received in writing within 30 days of published contest close date. 1) Eligibility: The Contest is open only to legal residents of the 50 United States and the District of Columbia, who are 18 years of age or older as of date of entry. Employees of OUTOOR NEWS, INC., herein referred to as the “Sponsor” and their immediate family members (spouses, parents, children, and siblings and their spouses) and household members of each (whether related or not), are not eligible to participate or win. Void where prohibited by law. All federal, state, and local laws and regulations apply. 2) How to enter the Contest: There is NO PURCHASE NECESSARY to participate in the Contest. A purchase does not increase your chances of winning. During the Contest Period, you may access the CONTEST by visiting the CONTEST PAGE on the OUTDOOR NEWS website page (the “Application/Website”) at http://www.OutdoorNews.com. To enter, completely fill out the entry form on the Application/Website and elect “Enter Now!”. All entries will be subscribed to receive emails from Outdoor News and the contest partner. You may opt out by clicking “unsubscribe from this list” once you receive your first email. Your entry must be received by 11:59 p.m. CDT on the date indicated on the entry form to be eligible for the Prize. Limit one entry per person. If you choose to unsubscribe so you will no longer receive emails from the Sponsor your entry will still be valid if it meets all terms of the contest rules. Use of computer programs and other automatic means to enter the Contest is prohibited and will result in disqualification. Any attempt by any entrant to obtain more than the stated number of entries by using multiple/different email addresses, identities, registrations and logins, or any other methods will void such entries and that entrant may be disqualified. Normal Internet access and usage charges imposed by your online service may apply. 4) Random Drawings: A minimum of one winner will be selected during the Contest Period from among all eligible entries received by the end of each Entry Period. Odds of winning a Prize depend on the total number of eligible entries received by the end of the Entry Period. Random drawing will be conducted on or about the first business day following the conclusion of the Entry Period during the Contest Period. Drawing will be conducted by Sponsor, whose decisions are final on all matters relating to the Contest. Prizes are awarded “as is” with no warranty or guarantee, either express or implied by Sponsor. Limit one prize per person/household. Winners are responsible for all applicable federal, state and local taxes and all other costs and expenses associated with their prize not specified herein as being awarded. 5) Winner Notification: Winner will be notified by email and must reply to the email within 5 business days from the time the email is sent to confirm their contact information. If any winner does not respond within the 5 business days, they will be disqualified and an alternate will be selected (up to a maximum of five (5) alternates for each Prize). Upon receipt and verification of winners contact information, within 10- 15 days after receipt of winner’s information, prize will be mailed by Standard US Postal mail. Return of any prize or prize notification as undeliverable will result in disqualification and alternate selection. 6) Prizes and Approximate Retail Value (“ARV”): The maximum ARV of the Prize is no greater than $150 and not less than $1. No transfer, substitution or cash equivalent for any prizes will be permitted, except at the sole discretion of the Sponsor due to unavailability for any reason and, in such circumstance, an alternate prize of equal value will be awarded and the Sponsor’s obligation to the winners will be fulfilled, and no other additional compensation will be provided. Acceptance of prize constitutes permission for the Sponsor and its agencies to use winners’ names and/or likenesses for purposes of advertising and trade without further compensation, unless prohibited by law. Prize will be awarded provided a sufficient number of eligible entries by the end of the Entry Period have been received. 7) General Rules: By participating in the Contest, entrants agree to be bound by these Official Rules and the decisions of the Sponsor. In the event there is a discrepancy or inconsistency between disclosures or other statements contained in any Contest materials and the terms and conditions of the Official Rules, the Official Rules shall prevail, govern and control. Entries become the property of the Sponsor. The Sponsor and its agencies are not responsible for technical, hardware, software or telephone malfunctions of any kind, lost or unavailable network connections, or failed, incorrect, incomplete, inaccurate, garbled or delayed electronic communications caused by the user or by any of the equipment or programming associated with or utilized in the Application/Website or the Contest or by any human error which may occur in the processing of the entries in the Contest or for any liability for damage to any computer system resulting from participation in, accessing or downloading information in connection with the Application/Website or Contest. In the event of a dispute as to any entry, the authorized account holder of the account used to register will be deemed to be the entrant. Winners may be required to show proof of being the authorized account holder of the account associated with the entry. Proof of entering information via the Application/Website does not constitute proof of delivery or receipt of such information. Sponsor (as identified in these Official Rules) is not responsible for the failure of any email or entry to be received by Sponsor on account of technical problems or congestion on the internet or at any website. The Sponsor reserves the right at its sole discretion to disqualify any individual that tampers or attempts to tamper with the entry process or the operation of the Contest or Application/Website; violates the Official Rules; or acts in an unsportsmanlike or disruptive manner, or with intent to annoy, abuse, threaten or harass any other person. Any attempt by any person to deliberately undermine the legitimate operation of the Contest or Application/Website may be a violation of criminal and civil law, and, should such an attempt be made, Sponsor reserves the right to seek damages from any such person to the fullest extent permitted by law. Sponsor’s failure to enforce any term of these Official Rules shall not constitute a waiver of that provision. If, for any reason, the Contest is not capable of running as planned, including infection by computer virus, bugs, tampering, unauthorized intervention, fraud, technical failures, or any other causes beyond the control of the Sponsor which corrupt or affect the administration, security, fairness, integrity or proper conduct of the Contest or Application/Website, then the Sponsor reserves the right at its sole discretion to cancel the Contest and select each Entry Period’s Prize winners from among all eligible entries received by the end of the applicable Entry Period prior to cancellation. By participating in the Contest, the entrant agrees that Sponsor, Facebook, their respective parents, subsidiaries, affiliated companies, agents, retailers, advertising and any Contest agencies, and all of their respective shareholders, officers, directors, employees and assigns, members, representatives and agents, will have no liability whatsoever for, and will be held harmless by entrant for any liability for any bodily injury, loss, cost or damages of any kind to persons, including death and property, damages sustained due in whole or in part, directly or indirectly, from entry creation, the acceptance, possession, use or misuse of the prize or parts thereof, if applicable or participation in the Contest or participation in any Contest or related activity. By entering the Contest, you hereby represent and warrant that you have read these Official Rules and are fully familiar with its contents. The Contest and the Official Rules shall be exclusively governed by and construed in accordance with the laws of the state of Minnesota, without regard to conflicts of law provisions. Entrants submit to exclusive personal jurisdiction in and agree that any dispute shall be brought in the state of Minnesota and federal courts in Minnesota. 8) Winners List: For the winners’ names, available after the closing date of the contest, send a self-addressed stamped envelope to Outdoor News, Inc. Contest, 9850 51ST Avenue N, Suite 130, Plymouth, MN 55442. 9) Sponsor: The exclusive Sponsor of the Contest is Outdoor News, Inc. 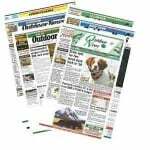 Contest Name: Outdoor News – First Effort Renewals Free Subscription Contest. Contest/ Sweepstakes Rules and Regulations: Contest will award a total of 70 one-year subscriptions to Outdoor News publications as following: Five subscriptions per state for each Outdoor News published title including Minnesota, Wisconsin, Michigan, Illinois, Ohio, Pennsylvania and New York. The contest prizes will be selected to be awarded two times within the period of Jan. 2, 2017 to Dec. 28, 2017 with drawings for winners from qualified entries received between 1/2/17 and no later than 6/29/17 to occur 6/30/17 and for entries received between 6/30/17 and no later than 12/28/17 to occur no later than 12/30/17. Drawing will be random in nature and winners will be notified via published listing in Outdoor News according to state [MN, WI, MI, IL, OH, PA, or NY] within one month of the two respective drawings. To qualify, entries must be received through the contest registration process which includes returning the mailed subscription form/ or electronic invitation to renew an existing subscription using an assigned Outdoor News subscriber account number as issued by Outdoor News Inc. which includes a subscription renewal. A non-purchase entry may be submitted by mail using a 3-by-5-inch card legibly written containing all of the following information: Daytime Telephone Number, First Name, Last Name, Complete Mailing Address, City, State, and Zip Code. Electronic, scanned, faxed, or photocopy non-purchase mail entries will not be accepted. Entries must be received by dates listed. Mail to: NON-PURCHASE CONTEST ENTRY, Outdoor News, Inc., 9850 51st Avenue N, Suite 130, Plymouth, MN 55442-3271. One entry per person. One winner per household. Sweepstakes open only to legal residents of the United States and the District of Columbia, who are 18 years of age or older or who have written parental/ guardian consent with the name of the contest clearly indicated. Void wherever prohibited by law. Employees of Outdoor News, Inc. / ODN SHOWS LLC are not eligible. No liability is assumed for lost, late, incomplete, inaccurate, non-delivered or misdirected mail, or misdirected e-mail, garbled, mis-transcribed, faulty or incomplete telephone transmissions, for technical hardware or software failures of any kind, lost or unavailable network connection, or failed, incomplete or delayed computer transmission or any human error which may occur in the receipt of processing of the entries in this Sweepstakes. By entering the sweepstakes, entrants agree that Outdoor News, Inc. / ODN SHOWS LLC reserves the right to contact entrants multiple times with special information and offers. Outdoor News, Inc./ ODN SHOWS LLC reserves the right, at their sole discretion, to disqualify any individual who tampers with the entry process and to cancel, terminate, modify or suspend the Sweepstakes. Winners agree that Outdoor News, Inc. publications/ ODN SHOWS LLC and participating sponsors, their subsidiaries, affiliates, agents and promotion agencies shall not be liable for injuries or losses of any kind resulting from acceptance of or use of prizes. No substitutions or redemption of cash, or transfer of prize permitted. Any taxes associated with winning any of the prizes detailed below will be paid by the winner. Winners agree to allow sponsors to use their name and pictures for purposes of promotion. Sponsors reserve the right to substitute a prize of equal or greater value. All Federal, State and local laws and regulations apply. Selection of winner will be chosen at random at the Outdoor News, Inc. office on or before date specified in contest promotion by Outdoor News, Inc. staff/ representatives. Winners will be contacted by the information they provided in the contest sign-up fields. Odds of winning will be determined by the total number of eligible entries received. Purchase is not necessary. Duplicate entries will disqualify entrant. If the contest is not a designated digital response entry, mailed entries must include contest name, required contest material, entrant’s name, date of birth, complete mailing address, daytime contact phone number and complete email address. Information must be printed and legible. Applicable mailed entries must be received on or before final contest date as stipulated on contest promotion. Late or illegible entries will not be considered. Mail to: NON-PURCHASE CONTEST ENTRY, Outdoor News, Inc., 9850 51st Avenue N, Suite 130, Plymouth, MN 55442-3271. Address may also be used for list of contest winners. Requires listing of contest name and include a self-addressed, stamped envelope. Request for contest winners must be received in writing within 30 days of published contest close date.